ShopTill-e is designed to track your stock and the central catalogue is the hub for all of your sales channels. ShopTill-e provides a very straightforward way for you to easily sell ad-hoc non-catalogue (products that you do not want to add specifically to your catalogue) items. Simply add one or more (if you want to be able to track these miscellaneous sales you can have series of these misc products to represent if types of items) new product called for example ‘Misc’ into your catalogue with the value of e.g. £1 (can be left with no value i.e. 0.00 if you prefer) and set stock tracking to ‘OFF’ just for this product also set product to be an ePOS only item (both done in the advanced tab). The sale is registered for the custom value; you can add a note to the receipt as well if you wish to. 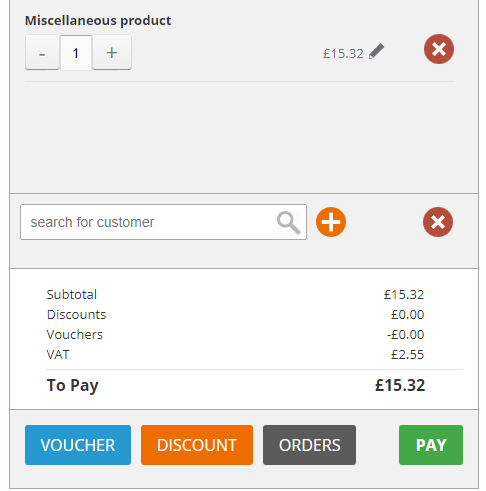 You can also use this same click the pencil icon to edit the price to for you to be able to offer ‘ad-hoc’ discounts on your product lines should you wish.